Present your favourite cheeses on this stylish engraved highland stag slate cheese board. Hand cut in Scotland from high quality slate, it is not only extremely durable but has a versatile functionality and natural contemporary elegance. The rectangular slate cheese board has been engraved with a beautiful hand-illustrated picture of a noble stag which adds an extra element of style and elegance. 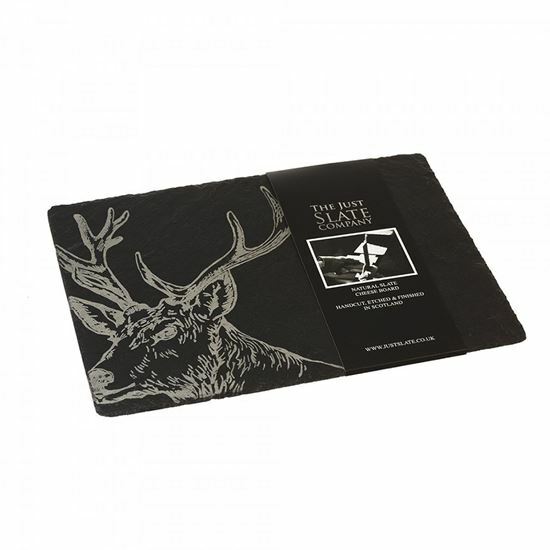 Team with our matching engraved Stag Slate Coasters to complete the look. Please note that, due to the size and weight of this item, there is a £2.00 shipping supplement.